Since 1917, the law firm of Ritter, Robinson, McCready & James, Ltd. of Toledo, Ohio, has been providing legal solutions to insurance companies, political subdivisions, businesses and families. 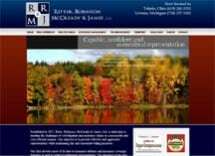 The firm serves clients in state courts throughout Ohio, Michigan and Northeastern Indiana. We also serve clients in Federal Courts throughout the Midwest. Ritter, Robinson, McCready & James, Ltd. has more than 110 years of combined attorney experience. This experience includes cases other firms avoid, such as complex litigation requiring detailed research, experience and lengthy time commitments. Our firm has extensive complex trial experience and welcomes the challenge of presenting an effective defense to a jury. We work with our clients to develop a defense theme and have enjoyed the results of a cooperative effort. Despite our eagerness to proceed to trial, we understand and appreciate the cost efficiencies of a good settlement. The firm strives to be both creative and effective in our defense. We are mindful of economics at each stage of the litigation process. As a result, we count among our clients many of the best known insurance companies, both regionally and nationwide. Besides insurance companies, we represent townships, cities, counties and businesses. We have trial experience defending cases involving all possible tort claims and serious damage claims including wrongful death, traumatic brain insult and other catastrophic injuries. While our roots are in the past, we have readily adapted to technology. As clients have gone paperless, so have we. Our success is dependent on our clients' success. We understand and appreciate our client's legal expense concerns. Our objective is to provide effective and aggressive representation while maintaining fair and reasonable billing practices. Ritter, Robinson, McCready & James, Ltd. is dedicated to providing capable, confident, committed representation.